White Diamond Pearl exterior and Beige interior. FUEL EFFICIENT 25 MPG Hwy/18 MPG City! Heated Leather Seats, NAV, Back-Up Camera, Satellite Radio, iPod/MP3 Input, Rear Air, Bed Liner, Tow Hitch, All Wheel Drive, Alloy Wheels. CLICK ME! Leather Seats, Navigation, All Wheel Drive, Rear Air, Heated Driver Seat, Back-Up Camera, Satellite Radio, iPod/MP3 Input, Onboard Communications System, Trailer Hitch, Aluminum Wheels, Remote Engine Start, Dual Zone A/C, Brake Actuated Limited Slip Differential, Smart Device Integration MP3 Player, Privacy Glass, Keyless Entry, Steering Wheel Controls, Child Safety Locks. Honda RTL-T with White Diamond Pearl exterior and Beige interior features a V6 Cylinder Engine with 280 HP at 6000 RPM*. 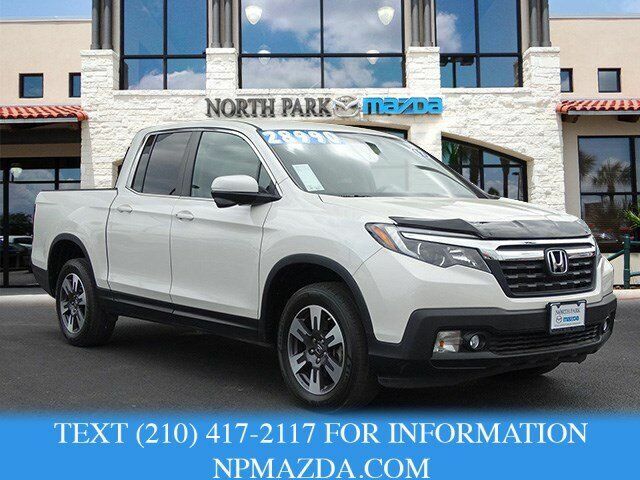 Edmunds.com's review says "The V6 engine is smooth, and that gives the Ridgeline an effortless feel around town. And it feels punchy when you floor it to make a pass or merge onto the highway. It took our test truck 7.0 seconds to accelerate to 60 mph at the track, which is tops in the midsize pickup category.". Great Gas Mileage: 25 MPG Hwy.